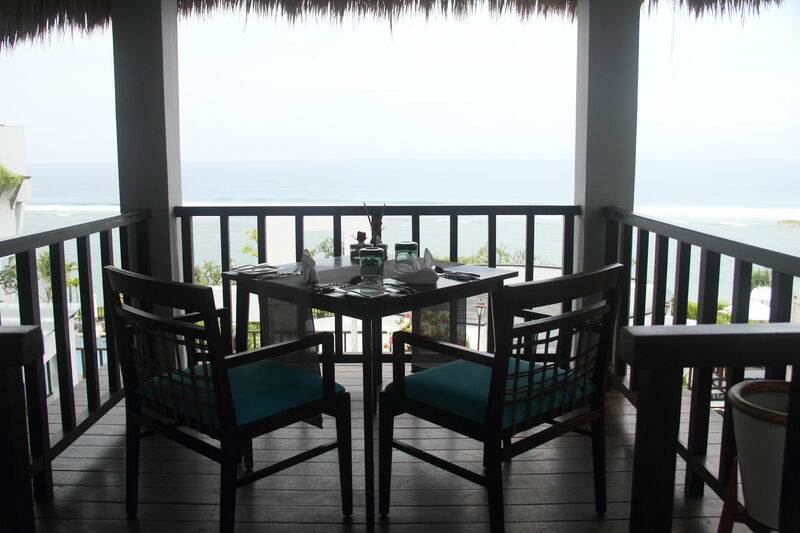 Ticking the Bucketlist » Samabe Suites: Honeymoon re-lived! What makes the honeymoon trip so special? Of course…you have recently gotten married! Anything besides that? Well, its the way everyone treats you. People go the extra mile to make you feel special and to ensure that life seems like paradise. That is exactly how we felt at Samabe… like royalty walking through paradise! We reached the Samabe reception drenched in sweat. I would blame the Balinese island heat, which was also responsible for making my hair frizzy and giving me the Einstein look. 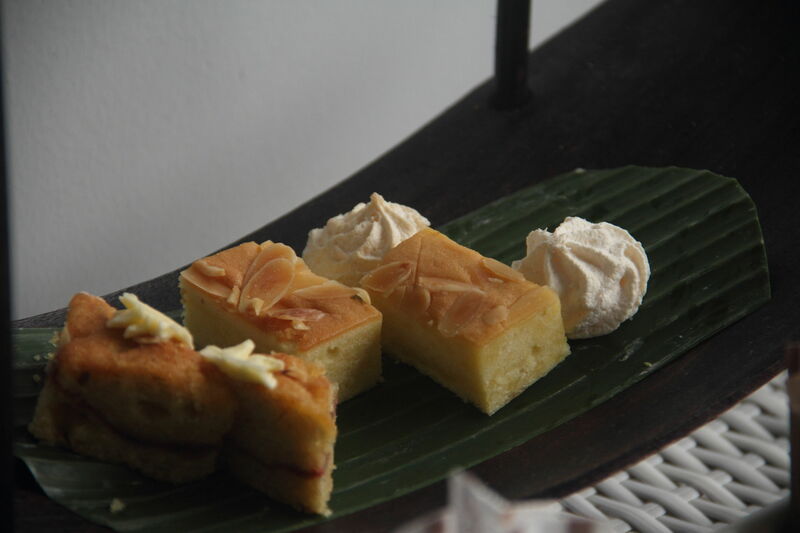 However, everything seemed to settle down as we wiped ourselves with cool minty towels, inhaled the fragrance of fresh flowers, sipped on fresh coconut water, stylishly served in a tall glass and listened to some soothing Balinese music. There is something about the place that puts one in the mood for romance. Maybe its watching the waves of the blue sea break at the beach… maybe its the lagoon full of water lilies… maybe its the tall coconut trees that whisper in the wind… maybe its the manicured gardens… maybe its all these put together! Whatever the reason, romance was in the air! 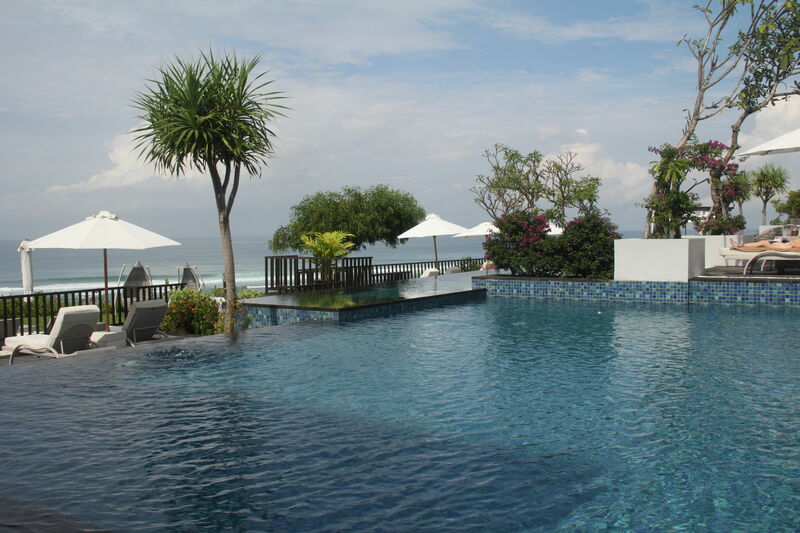 Samabe Bali Suites and Villas are located at the Southern end of Nusa Dua, on top of a cliff. We loved the greenery all around. No matter where we went in the resort, we could see the blue sea and the golden sand. If you are worried about walking up or down the slopes, relax and breathe easy. The resort has buggies to ferry you around the property. We are all allowed to be a little lazy on a luxury vacation, aren’t we? Samabe has its own private beach – well maintained and clean. However, to get to the beach, one needs to walk down about 150 steps (and obviously, retrace one’s path to the room). We actually did not find this cumbersome and descended the steps to reach the beach, where there were only two more couples. We had our own little corner on the beach…and we loved it! The bartender at the the little beach bar got us our drinks and we slurped and sipped on the colourful concoctions under the shade of a large tree. The beach and the kayak… just for us! Ankur and I have this unwritten rule: We will not stay in any beach resort that does not have a pool. Better the pool, higher is the resort on our ‘liking list’. 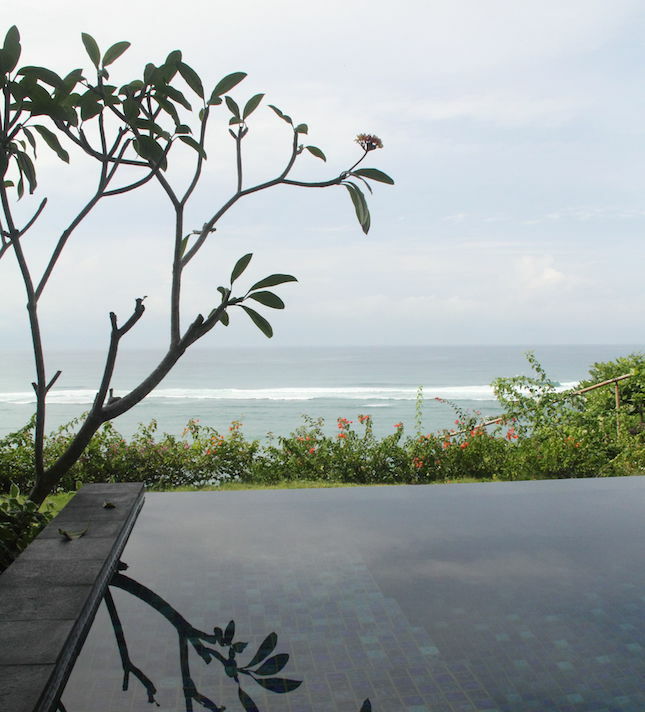 This luxury resort in Bali has an infinity pool and we loved it. Ankur, especially, has an affinity towards infinity pools and thoroughly enjoyed the splash time in Vilamendhoo (Maldives) and Coorg (India). He had an equally delightful time at Samabe. The best part was that the pool was never crowded; at times, it was just the two of us! It’s a rare occasion when an infinity pool in a luxury resort turns into your private pool…and we love such occasions! On one occasion, while we were lounging around the pool, two dainty ladies walked up to us and asked us of we wanted a head or a foot massage. Who says no to a massage? But we politely declined as we had a spa appointment later in the evening and didn’t want to spend the additional bit at the pool. Well, we didn’t have to spend – the 15 minute head/foot massage by the pool, with cucumber slices on our eyes was complimentary. We were pampered silly! Imagine a big room in a luxury resort, large and spacious. Now, make it bigger – we stayed in a family suite. Don’t miss out on a large sitting and dining area….its a suite we are talking about. Add in a private pool that faces the blue sea. Maybe you can now picture our room at Samabe. If not, here are some pictures of the luxurious room that was our den. The pictures make us want to go back! We loved the little things in the room that made our experience special. 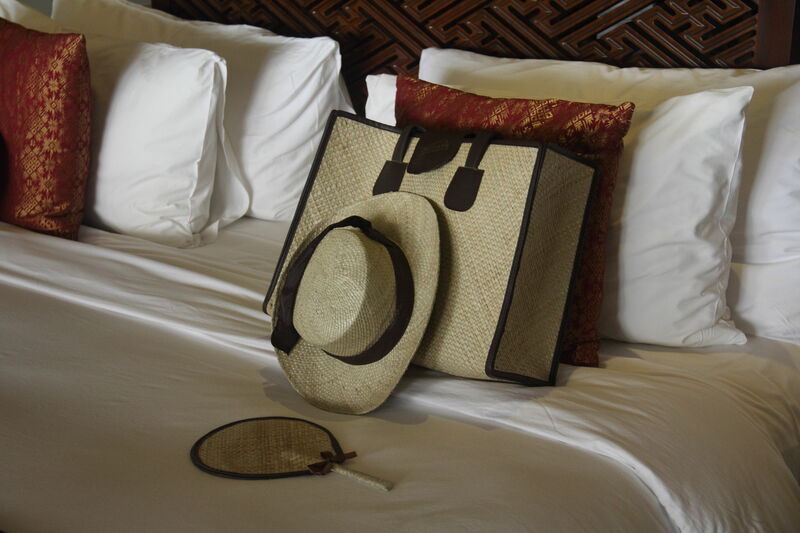 The room had beach hats, a beach bag and a hand fan that was also a souvenir from Samabe. There was a telescope to help you spot ships at the horizon and track constellations at night. We had our own little private pool. It was a cool rainy day when were there and I chose to munch on my sandwich while Ankur took a customary dip in our own little pool. Being the tea person that I am, I loved sipping on unending cups of tea that was placed as a welcome gesture in out room. Ankur enjoyed some chilled beer from the minibar. Hush hush… the mini bar is included even for those who are not on an all-inclusive plan and have limited privileges! 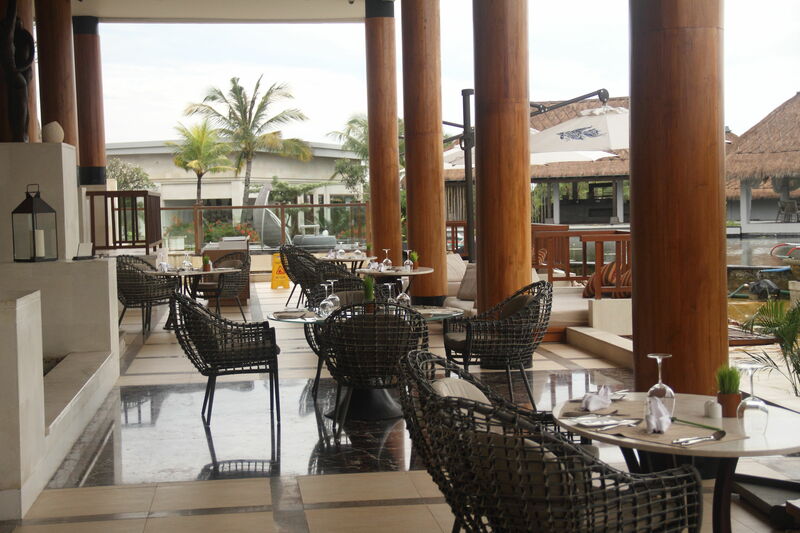 Samabe has two restaurants – Rempah Rempah, which is also where the breakfast is served and Crystal Blue, which is a more formal yet intimate set up, overlooking the sea. Rempah Rempah has an air-conditioned chamber as well as al fresco dining areas. We had breakfast at Rempah Rempah… gluttony at its best! Later in the evening, we had a couple of drinks to lead us into a ‘happy’ state of being as we looked over the lily pond and then had a candle lit romantic dinner at Crystal Blue. The breakfast buffet is super fancy! Needless to say, the restaurant passed our croissant test – perfect croissant, crisp on the outside and soft on the inside, served with bitter sweet marmalade. 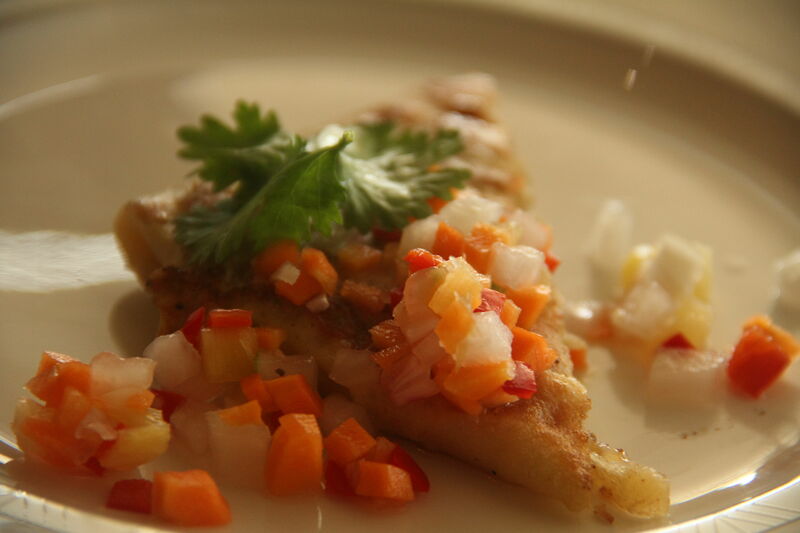 I ate like a glutton alternating between savoury and sweet. There was freshly made sushi for breakfast too. But for me, the highlight was the chocolate fountain with strawberries… the thought makes me drool! 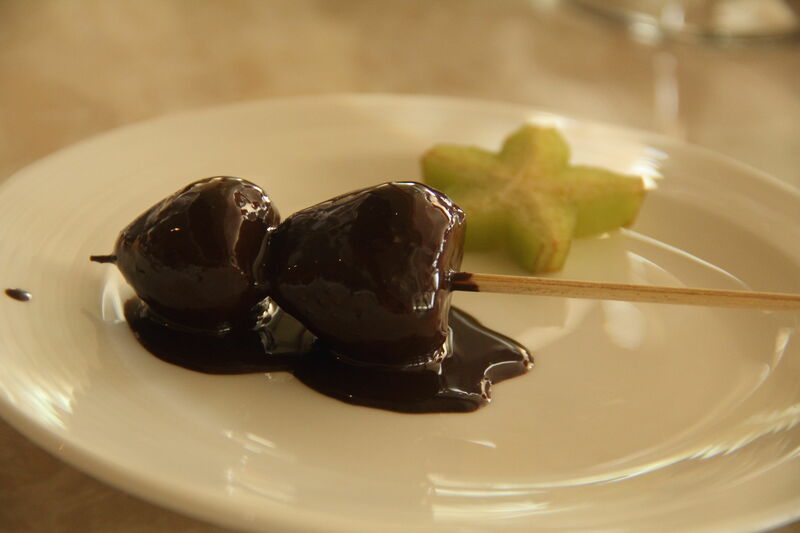 Chocolate fountain… that is what ‘good morning’ means! You can have breakfast anytime of the day in your room as per a set menu. Sometimes, it does seem unfair to get up early in the morning to ensure that you don’t miss the breakfast buffet. Why should one have to get up early on a vacation? Samabe makes sure you can sleep in late, and still be well fed! Teatime calls for some goodies: There is a small snack basket comprising of cakes, cookies and sandwiches that is served as afternoon tea. Just like your breakfast, you can have your afternoon in your room or in the restaurant… or by the pool… or just anywhere in the resort… at anytime! We had dinner at Crystal Blue. While the vegetarian options were limited (we weren’t expecting a big vegetarian menu in a grill restaurant either), the quality of food was excellent. 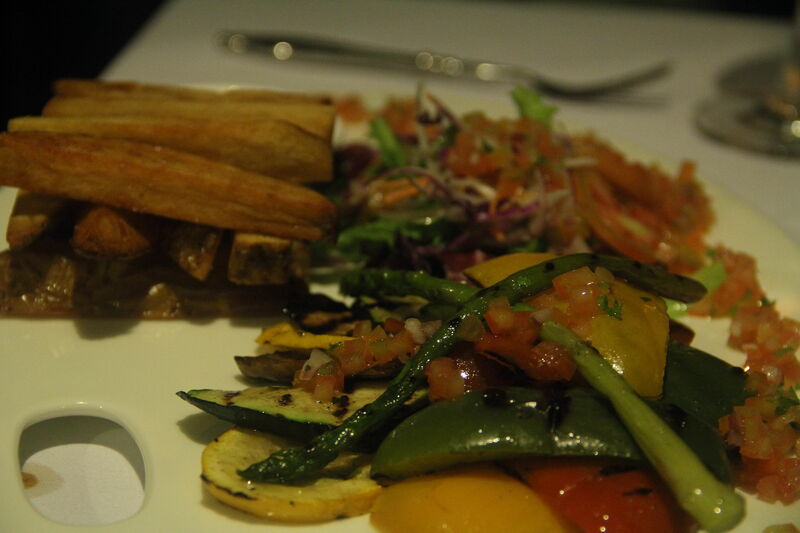 Ankur had some perfectly grilled vegetables and I enjoyed the local cuisine. Thumbs up for both the dishes! What really sealed the deal was the service… we felt truly cared for! For those (like me) who are a feast for mosquitos, the restaurant keeps herbal sprays handy to keep the bugs at bay, thus ensuring that you enjoy your dinner. It’s the smaller and finer details that make a place memorable… and the dinner at Crystal Blue sure was a memorable one! 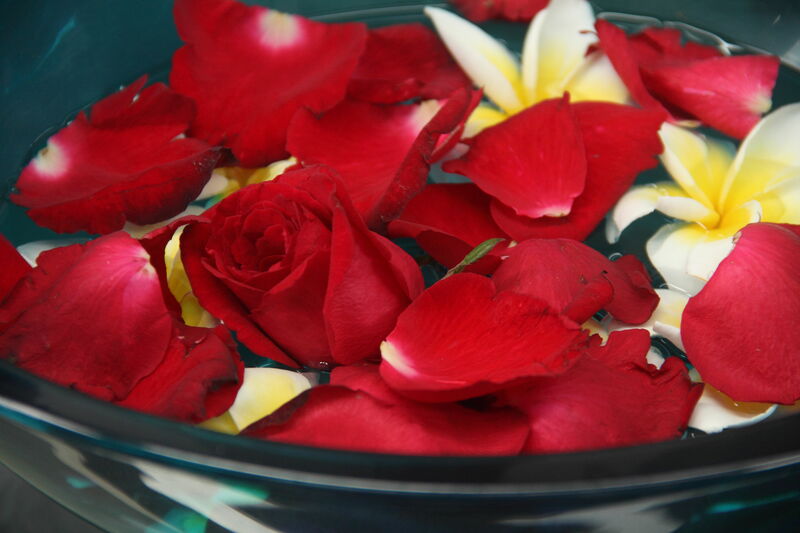 How can the honeymoon be complete without a spa therapy? 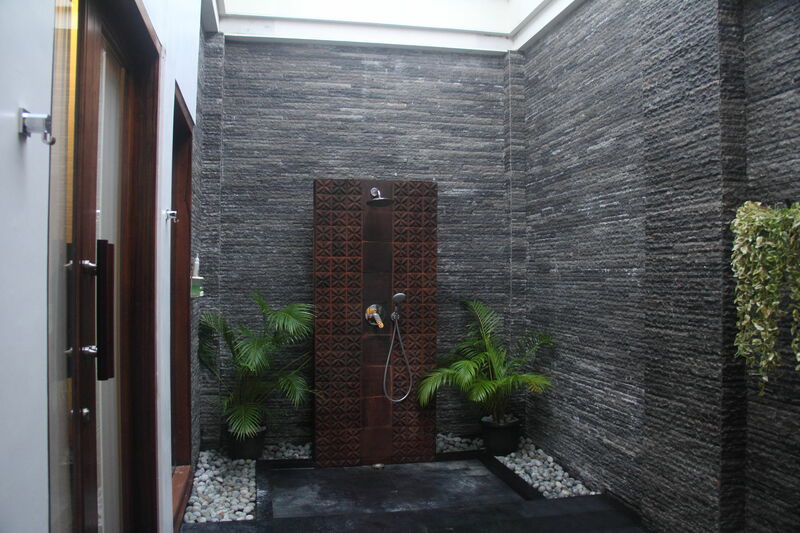 The Galangal Spa at Samabe lets you relax every muscle of your body in the very confines of your room. However, we wanted to walk around the resort and preferred getting our treatments done in the spa itself. One hour later, we could barely manage to get ourselves off the spa table…we were in deep sleep! Ankur and I aren’t into yoga and meditation. ‘Maybe this is what ‘deep relaxation’ feels like’, we thought to ourselves. 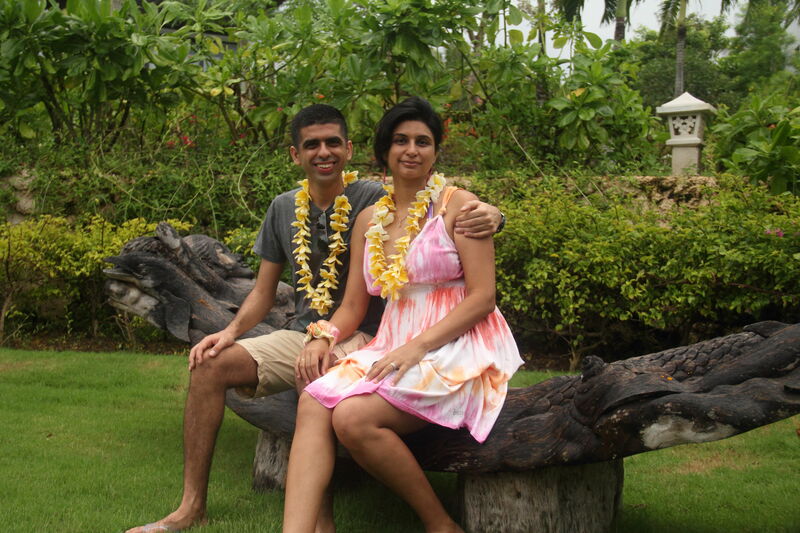 The whole world talks about the ‘Balinese’ massage and Ankur chose to get that done – obviously, we were in Bali. However, I wanted to add an experimental spin to the treatment and got a hot stone massage done. The massage felt good, but I felt even better after a couple of hours and slept like a baby that night. Shhh… lets not discuss my ability to snore when I sleep like a baby! Samabe is one of the most luxurious resorts that we have stayed in. The property in itself is beautiful and one feels surrounded by Nature. The service levels are exemplary. Within a couple of hours, the entire staff knew our name, whether it was our buggy driver, our restaurant hostess or the front office staff…we were always greeted by our name! The whole experience was warm and personalised. It truly is commendable to experience such personalisation and care, regardless of the property’s size. If you want to feel special, book yourself in the Samabe and forget about everything else…the staff will take care of it all! The Samabe offers luxury all inclusive as well as limited privileges during your stay starting at ~USD 400 per night. 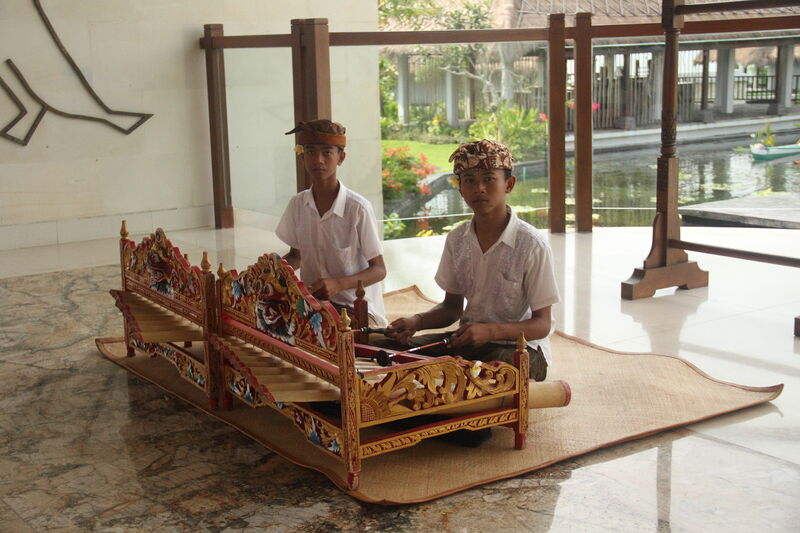 Click here to book your room at the Samabe. 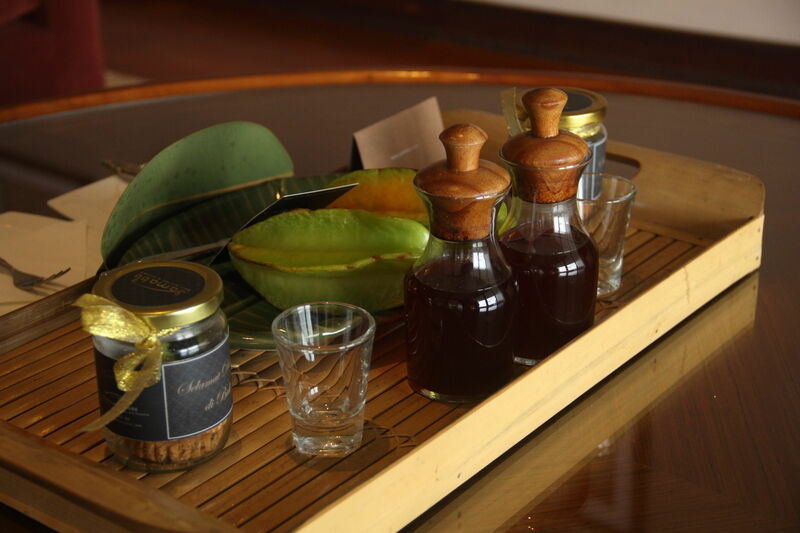 We were guests of the Samabe Suites and Villas and the Galangal Spa during our visit. As always, all ramblings are the offsprings of our mind and personal experiences!